How Not To Get Cheated While Buying A Home? The Government launched RERA on 1st May 2017 with the intention of bringing fair practice and transparency to the real estate sector. Under RERA, all builders have to register their projects with a real estate regulator. Visiting the RERA website will help you know everything on developments in the real estate industry. 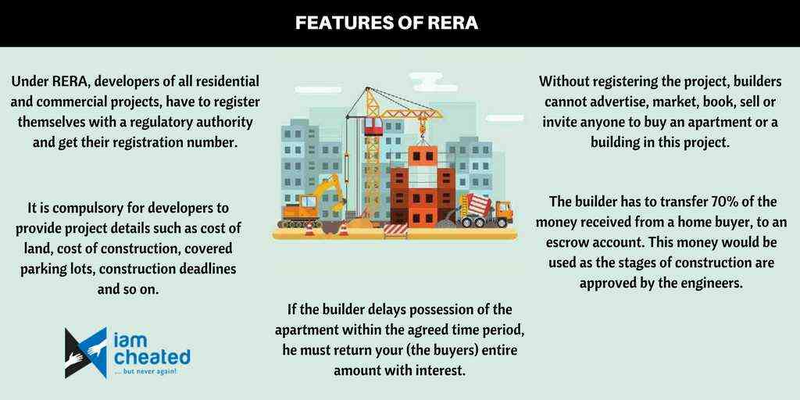 The main advantage of buying a home from a RERA registered project is you get complete details on the project and the developer. If the developer doesn't deliver your flat on time, the RERA authority will take strict action against the developer and he has to pay 2% interest above the SBI lending rate to homebuyers. If you want to buy a property in Pune, then before buying, log on to the Maharastra RERA website. You will find details of registered projects in Pune. You should always check these documents before buying a house to avoid getting duped. The Allotment letter will be given by builders to the buyer. This contains the construction schedule, house plan, date of delivery of the flat and the agreed purchase price between the buyer and seller. The Building Completion Certificate confirms the adherence to municipal requirements. The building should follow certain norms such as the height of the building should not overlook a military installation, should be at a certain distance from the road and should be suitable for habitation. The sale deed of the apartment gives the seller the right to sell the apartment. You should have a copy of the original sale deed between the developer and the first buyer. No due certificate confirms that additional charges will not be levied on you in the future. The possession letter transfers the ownership of the property from the seller to the present owner.